We’ve just reached a big milestone, as Autumn has recently turned 1 year old! 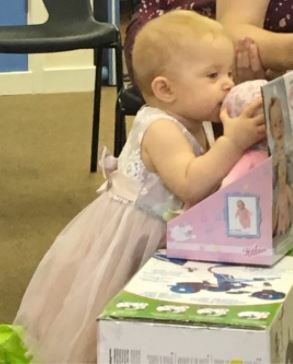 Many people seem to think that this is the age where they transition from being a “baby” to a “toddler”. However, I don’t feel ready for that change in title. Even though I’ve savoured the last year, knowing how fast it would pass, it’s still gone much too quickly for my liking! 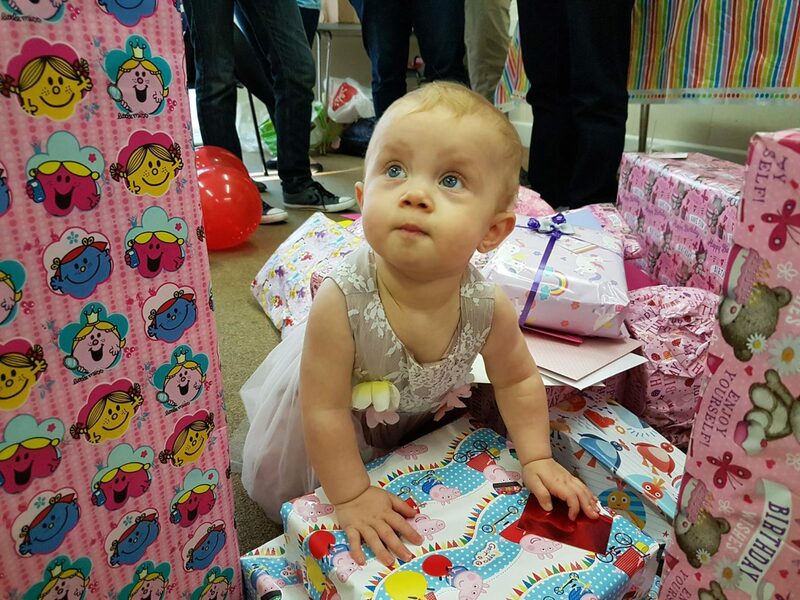 Although she’s a bit young to really understand what’s going on, I think Autumn had a lovely birthday. We spent the first part of the day in her room opening presents and singing. She was actually quite good at helping me to open presents! 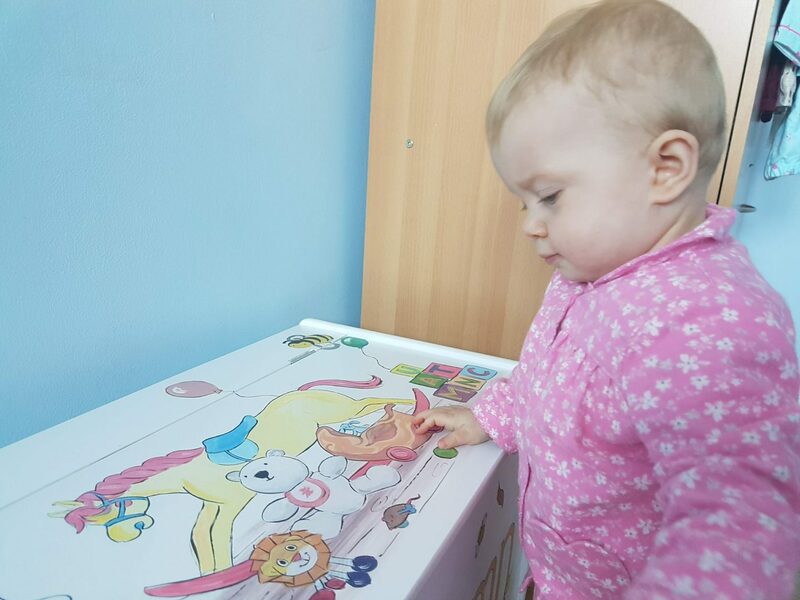 The biggest present we got her was a beautiful toy box from Pastures New in Rochester, Kent. It was painted especially for her and even features some of her most favourite toys on it! The bear on the top was given to me for her before she was born and one of her first proper smiles was when she was looking at it. As well as the bear, she also has her special lion and bee toys on there. She has so many toys now, especially after her birthday, that it’s just as well we got her a toy box! She seems quite fond of it too. 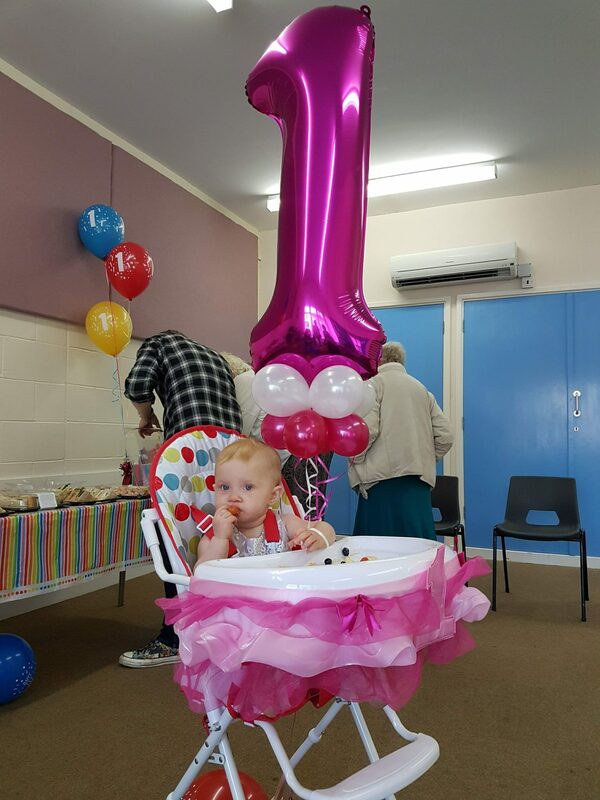 After Autumn’s christening at the beginning of August, we decided to go a bit more more low-key for Autumn’s birthday, spending less money and inviting more people. One of Autumn’s favourite programmes is the Twirlywoos on cBeebies. Whenever she hears the theme tune she gets excited, often standing up, clapping and smiling at it on the screen! 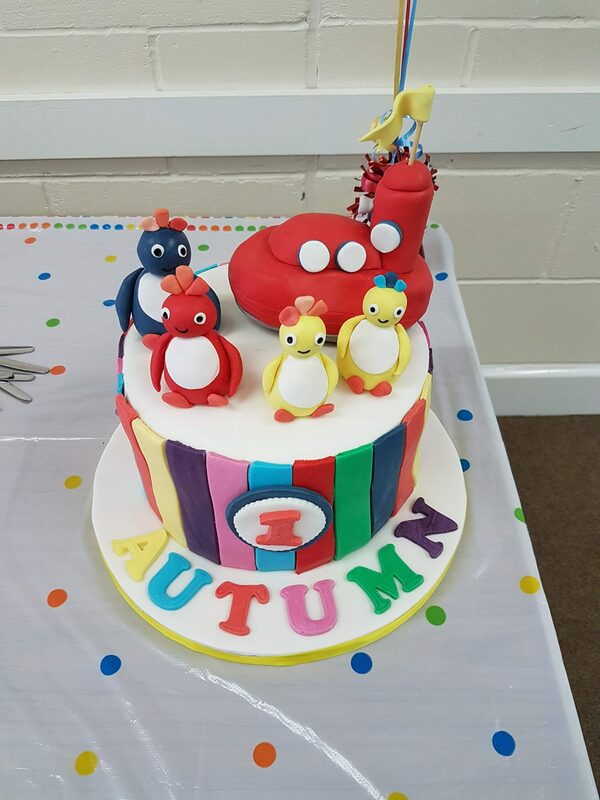 As such, we decided to have a Twirlywoos theme. For those who aren’t aware of the Twirlywoos, it’s about four brightly coloured bird-like created called Great BigHoo, Toodloo, Chickedy and Chick. 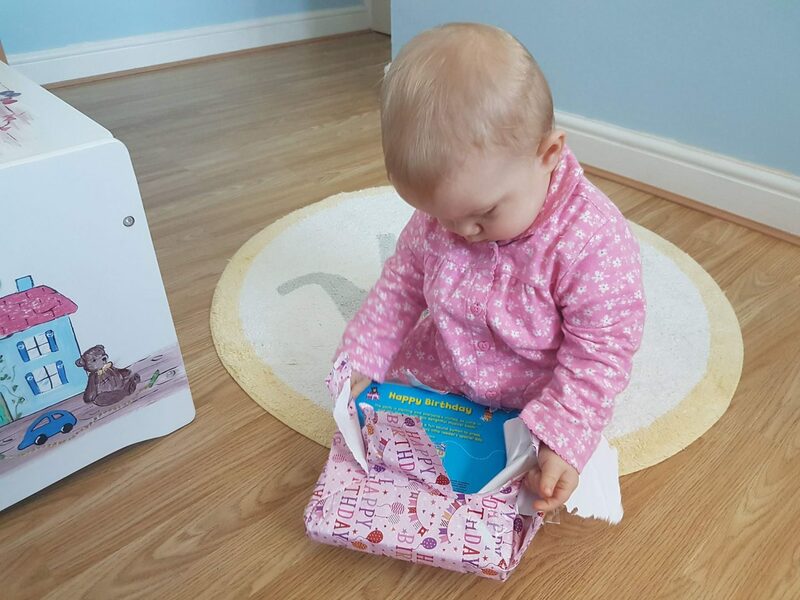 They go on adventures to find out more about the world, helping young children to understand concepts such as upside down and up and down. We ordered a cake from the super talented Helen at Homemade with Love cakes in Gravesend. We discussed the design together and I was really happy with the result. It was such lovely bright colours and had the Twirlywoos and their big red boat on top. It was delicious too! We ordered the rainbow tablecloths from the internet, as well as a few other bits that we weren’t sure we could source locally. After being so pleased with the balloons we got for Autumn’s christening, we went back to Bustles & Breeches in Gravesend for balloons. We ordered a bright pink one, as well as balloons in the colours of the Twirlywoos. So dedicated is Natalie to her job that she researched the Twirlywoos and made sure the colours of the balloons were in the right order (biggest to smallest Twirlywoo) and the ribbons done for each balloon according to the hair/feathers/whatever that is on their heads! Once again they were fantastic and the balloons are still lasting really well. 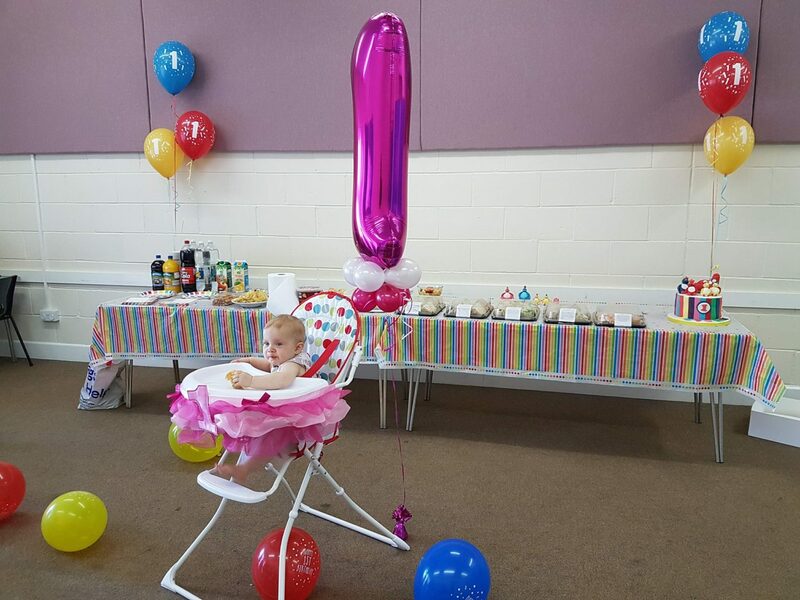 As you can see from this picture, I even managed to get a decoration for the high chair and I also got some little Twirlywoo figures for the food table! The food for this party wasn’t such a big thing, fortunately! We went to Aldi a couple of days before and picked up lots of party food. We were going to make the sandwiches ourselves, but my parents-in-law went to Costco and picked up sandwiches and wraps instead. I didn’t have any of them, but apparently they were very nice! I also ordered some Twirlywoos wafer decorations online and stuck them on some fairy cakes I made. The cake went down well with Autumn! When it got to present time there were SO MANY PRESENTS. Friends and family were so kind and bought her such lovely things. At first, she was helping me to open them and looking at them. I think she just got overwhelmed and excited in the end because she was crawling over them all and picking up one. Then she’d let go and crawl over to another one!